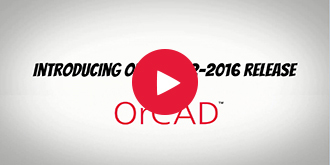 The OrCAD PCB Designer 17.2-2016 release also include new features or enhancements targeted towards improving PCB editors’ productivity and ease-of-use. 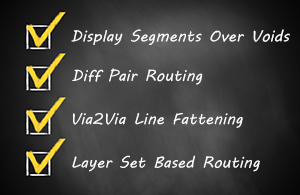 Other new features include: Via2via Line Fattening (HDI), Display Segments Over Voids, Layer Set Based Routing, Diff Pair Routing and DRC, Full Xnet Support, Gloss Commands, Contour Routing, and many more! Open Demo Design: The new Open Demo Design browser gives access to more than 150 demo designs made available from different locations, collated together to help users better understand Capture, Capture CIS and Capture _ PSpice Flow. Export - Import XML: OrCAD Capture provides you the capability to convert Capture designs to XML format and vise-versa based on the requirement. 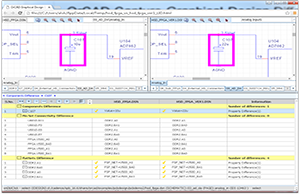 ISCF Export : Introducing direct ISCF (Intel Schematic Connectivity Format) feature for automating Intel-based design reviews to export hierarchical schematic designs in an Intel-approved format helping users optimize the design review process. PDF Export: The new PDF export functionality lets users export Capture design as PDF file and provides intelligent design information. Extended Preferences setup: The extended Preferences Setup window allows you to modify additional application settings in OrCAD Catpure like Command Shell, design and libraries, design rule check, CIS, NetGroup, NetList and Schematic. - Stack up by zone: The new feature improves MCAD-ECAD co-design and provides faster, easier definition of stack-ups for rigid-flex rigid designs. - Inter design layer checks: The new inter layer functionality provides ability to check geometries between two different class/ subclasses for flex and rigid flex designs. - Arc routing - A new prototype feature to provide more efficient method to add routing during Add Connect by following an existing connect line or a route keep-in. New padstack editor – Introducing modern user interface for convenient padstack creation with addition of new geometries and support for counter-bore/ counter-sink definitions and several new drill features. Shape Edit Application Mode –Introducing new functionality that is a fine tuning editing environment to increase efficiency with shape boundary editing and simplifying actions such as sliding a shape edge or adding a notch etc. Color and Visibility enhancements – The Color Dialog box has been enhanced for better efficiency and ease of use for designers and the Visibility pane now provides access and control over layers other than the conductor layers. 64 Bit Support – Now available support for 64 bit OS with increase in memory size from 4GB to 18 Quintillion and support for Database sizes upto 3GB. More gains in performance for CPU intensive applications. Spread Line between Voids – New command to provide semi-automatic solution to spread channel based clines with respect to adjacent plane layer voids. Contour routing- Now available in both single and mutli-routing modes, contour hugging locks the current route to either the route keepin or adjacent cline. Group routing – User can now perform group routing by window selecting around a group of objects(Clines, Vias, Pins, Rats) and be able to change the control trace from its initial location to user defined and go into single trace mode to complete routes. Gloss Commands – Richer set of gloss commands like Eliminate Vias, Convert corners to ARC, Fillet and Taper traces and many more now available in OrCAD PCB Designer. Differential Pair Routing and DRC – Users can now define physical and electrical rules for Differential pairs complemented by routing support. 64 Bit Simulation Engine and Result Analysis – Leverage full potential of compute platform to perform simulation and waveform analysis on extremely large designs. New functions for Behavioral models – a set of Delay() functions to introduce delay in behavioral models or controlled sources. Support for TCL 8.6 - In 17.2 release Capture and PSpice support TCL 8.6. What's New in Allegro 17.2 2016 ? The Cadence® Allegro® 17.2-2016 release enables a more predictable and shorter design cycle. The portfolio features comprehensive in-design inter-layer checking technology that minimizes design-check-redesign iterations and a new dynamic concurrent-team-design capability that accelerates product creation time by up to 50 percent. Utilizing material inlay fabrication techniques, these new capabilities can reduce material costs by up to 25 percent. In addition, embedded Sigrity™ technology now ensures critical signals meet performance criteria and power integrity (PI) for PCB designers addressing power delivery and IR drop issues efficiently, eliminating time-consuming iterations with PI experts. Multiple zones can be created using the new Cross-Section Editor to represent rigid-flex-rigid PCBs. 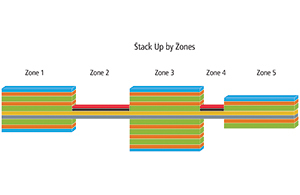 The stack-up by zone feature provides faster, easier definition of stack ups for rigid-flex-rigid designs and improves MCAD-ECAD co-design. The Allegro PCB Editor 17.2-2016 release introduces new in-design inter-layer checks for flex and rigid-flex that save manual effort and ensure all rules for advance flex designs are adhered to, avoiding many design-check-redesign iterations. Enhanced Contour is a more efficient method to add routing during Add Connect by following an existing connect line or a route keep-in, which will save time for PCB designers working on flex designs. The Cross-Section Editor has been redesigned, leveraging the underlying spreadsheet technology found in Constraint Manager. It offers one-stop shop for features that require the cross section for their setup, such as dynamic unused pad suppression and embedded component design. The New Allegro dynamic concurrent-team-design capability focuses on shortening the largest portion of the PCB layout design cycle. 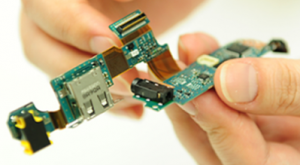 It provides dynamic concurrent PCB team design for multiple PCB designers to work on the same design at the same time without any set-up requirements. In addition, new features—including interactive etch-editing capabilities, Allegro TimingVision™ technology, auto-interactive delay, and phase-tuning capabilities—provide proven time reductions to route advanced high-speed interfaces such as DDRx and PCI Express® (PCIe®) by up to 80 percent. A new Padstack Editor eases padstack creation through a new modern user interface. 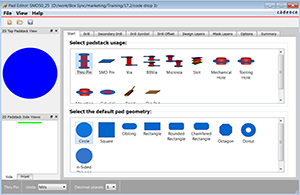 New features include the padstack designer, padstack usage types, pad geometries, and several new drill features. Many improvements have been made to the backdrill process to assist PCB designers in managing the backdrill vias/padstacks, route around the backdrill vias/padstacks with accurate DRCs, and real-time feedback. Tabbed routing is a new routing strategy in which trapezoidal shapes called tabs are added to parallel traces to control impedance in the pin-field/breakout region and crosstalk in open-field region. This method enables longer trace lengths and use of smaller trace spacing. Tabbed routing is used for impedance control and to manage crosstalk in critical signals, enhancing signal quality and improving route channel utilization. The Allegro 17.2-2016 release enhances the six via structures for managing return paths for critical differential signals during Add Connect by allowing users to create using Allegro PCB Editor, validate using proven Sigrity technology, and instantiate a custom return path via structure during Add Connect. The Visibility Pane has been enhanced to allow designers access and control of layer content more quickly and more efficiently. The Shape Edit Application Mode is a tuned editing environment primarily designed to increase efficiency with shape boundary editing. 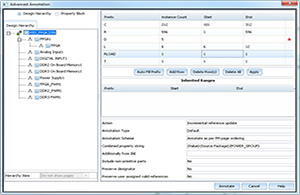 Many ease-of-use and productivity improvements have been made to Allegro Constraint Manager. Users can now embed a watermark such as “First Prototype,” “Confidential,” or “Review Copy” in the generated PDF file. ECSet nodes now support tags (pin parameter), which can be used to uniquely identify a pin and remove any ambiguity. Net Groups can be pushed across different levels of hierarchy by creating a Port Group. The Port Group is made available to higher-level blocks through the hierarchical block symbol where they appear with a new Pin Shape for unique identification. A new DE-HDL console command is now provided to import a file containing the pin delay values that can be used to define the complete delay for pin pairs. The format of this file is exactly the same as that one used for import/export by PCB Editor. A significant advancement in Allegro design management features is the ability to manage designs at the page level, for both hierarchical and flat designs. 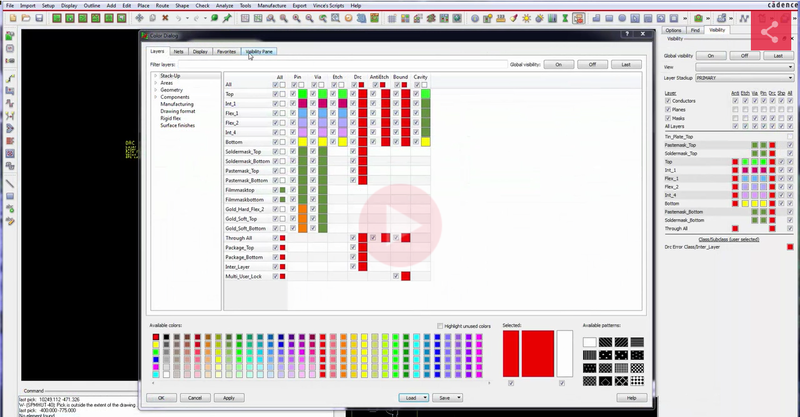 Graphical Design Difference Viewer is a powerful, real-time, design difference, visual review utility in Allegro Design Entry Capture with the ability to perform logical as well as graphical comparisons on a page-by-page basis. With the newly introduced Advanced Annotation feature supported by Allegro Design Entry Capture, users can assign reference ranges hierarchically by automatically assigning values and perform annotation on the whole design, on hierarchy block at any level. 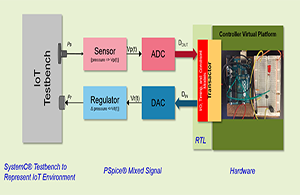 New functionality introduced in PSpice® helps to overcome design challenges for electrical engineers by automating the code generation for multilevel abstraction models written in C/C++, SystemC. A new “FSP Bundle Swap” option is available. If the two bundles are the same size, the PCB designer can select the bundles and ask the FPGA System Planner engine to swap them, pin for pin. FPGA System Planner 17.2 also offers three new manual pin-swapping algorithms: show all destination pins, show all destination pins in the same bank, and two-pin selection. Users can now create complex connector models with user-defined pin types and signal group capabilities. 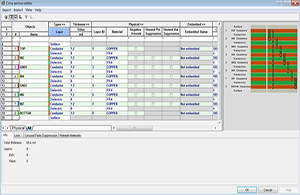 When selecting the FPGA System Planner project in Allegro PCB Editor, the PCB designer can select any one of several FPGA System Planner projects that are part of the master design. All of the team design functionality is now built directly into Allegro Design Authoring DE-HDL. Team members can stay within DE-HDL to check out/in designs using menus integrated into the DE-HDL hierarchy viewer or by using a design dashboard. And users have the ability to manage designs at the page level, for both hierarchical and flat designs. Hierarchical split symbols can now be managed with Allegro Library Manager. Allegro EDM 17.2 now supports the standard library that contains the page borders, ioports, taps, power symbols, etc., so that librarians can not only manage these parts, engineers can stay connected to the database to select them.